Family matriarch, Zita (Bailey Whiteman, center) reads the Last Will & Testament of Buoso Donati, who has just died. 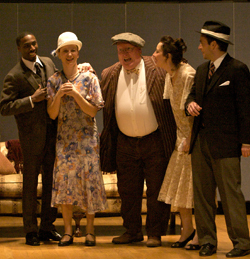 Village charlatan Gianni Schicchi (Daryl Ott, center) agrees to help the Donati family "forge" a new will. 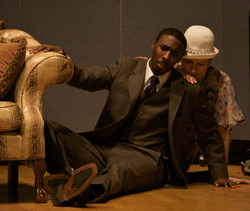 Marco (Darrick Speller) and Ciesca (Kristi Baeseman) bemoan their lack of wealth. 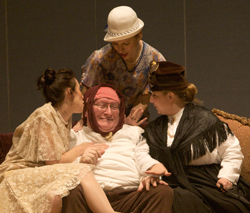 The Donati women, Nella (Melody Prochazka), Ciesca (Kristi Baeseman) and Zita (Bailey Whiteman) attempt to seduce Schicchi (Daryl Ott) into leaving them a fortune. 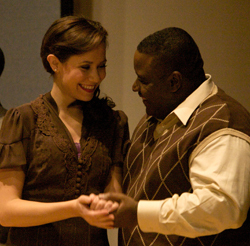 Lauretta (Adrianna Sgarlata) and Rinuccio (Keith Craig) pledge their love. 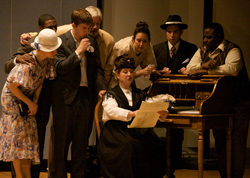 Amancio, the Notary (Robert Thomson, front right) reads the revised will as dictated by Gianni Schicchi (Daryl Ott, on sofa).